Indianvisit offers complete information on the wildlife Resorts in Kerala, accommodation in wildlife Resorts in Kerala, dining at wildlife Resorts in Kerala, and other facilities at the wildlife Resorts in Kerala. Wildlife in Kerala is one of the major attractions in the state, which is well known all over the world for its tourism, especially its backwaters. The National Parks and wildlife sanctuaries in Kerala are famous tourist destinations and are of utmost importance to Indian wildlife as they provide protection to some of the rare and threatened species found in the region. The most famous wildlife destinations in Kerala are, Periyar, Eravikulam, Silent Valley and Wayanad. One of the most famous protected forests in India, the Periyar National Park is situated beside the Periyar Lake. The total protected area is about 777 square kilometers, out of which 350 square kilometers have been declared as a National Park and tiger reserve. The wildlife in Periyar comprises 62 species of mammals, 320 birds and 45 reptiles along with a large number of amphibious species and insects. 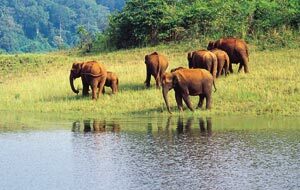 The chief animals to be seen in Periyar are Dhole, Nilgiri langur, Nilgiri Tahr, elephants, tigers, leopards, and the bonnet macaque.The park has a healthy elephant population, estimated to be close to 1000. The flora of the forest is chiefly evergreen or semi-evergreen vegetation, and includes 2000 species of flowering plants. Thekkady is the gateway to Periyar and tourists usually stay in Thekkady during their visit to Periyar. Eravikulam was given National Park status in 1978. The core area of this park is 97 square kilometers. The Nilgiri Tahr is the main attraction in Eravikulam, being a severely threatened species. The fauna of the park includes well known Indian species like the Nilgiri Langur, Dhole, elephants, leopards, civets, and a large number of birds, reptiles, amphibians and insects. The park is located about 15 kilometers from the hill station of Munnar. Kochi is the nearest airport, 135 kilometers away. The Eravikulam National Park is one of the major attractions of tourism in Kerala along with the other major National Parks of the state. This pristine forest is one of the last remaining tropical moist evergreen forests in India. The forest was declared a National Park in 1983, and was inaugurated in 1985 after a long debate over a proposed hydro-electricity project which threatened the survival of the lion tailed macaque, one of the endangered species found in the region. The Silent valley National Park is located in the Palakkad district of Kerala, which is also a hub of backwater tourism. Silent Valley has a core area of 89.52 square kilometers. The chief mammal species found here include the lion tailed macaque, Malabar Giant squirrel, flying squirrel, civets and leopards, apart from a large number of birds, reptiles, amphibians and insects. The flora of the park is equally varied with large number of plant species including orchids and ferns, many of which are endemic to the region. Coimbatore in Tamilnadu is the nearest airport, 55 kilometers from Silent Valley. The Wayanad wildlife sanctuary, also called Muthanga sanctuary, was declared a protected area in 1973. It is a part of the Nilgiri biosphere reserve and borders Nagarhole, Bandipur and Madumalai. The sanctuary has seen a steady growth in elephant population after the project elephant was started here in 1991. This beautiful forest has a healthy population of important animal species like, elephants, leopards, sloth bear, chital, dhole, langur, and gaur. The area of the park is 345 square kilometers, and Kozhikode (140 kms) is the nearest airport and railhead. Thattekkad bird sanctuary, Kumarakom, Idukky wildlife sanctuary, and Chinnar wildlife sanctuary are among the other protected forests preserving wildlife in Kerala. The forest department and the related authorities have made commendable efforts to protect Wildlife in Kerala. However, a lot more needs to be done as the threats of poaching, deforestation, and urbanization cast a heavy shadow on the flora and fauna of the state. Touristplacesinindia.com offers all inclusive information on Wildlife in Kerala and other tourist places in India.